Just wanted to get my new app out there and a little bit of feedback from other android developers and fans alike. Congrats on the first app! Everyone needs a break now and again and if youre like me, you like those epic fails and love to Chive on. 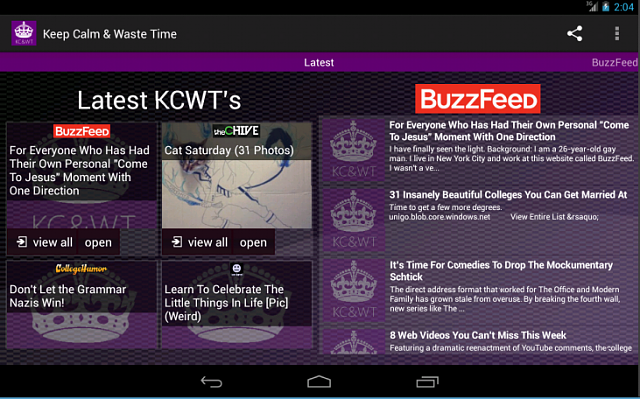 Keep Calm and Waste Time is the app for you, it combines galleries and links to seven of the webs greatest sites. Now you will never miss a fail, your fix of daily morning awesomeness or any of the latest memes doing the internet rounds and all from a single app. This app is the best way to cram in more time wasting to those precious five spare minutes you have on the train to work . If you are from New York or New Delhi this app will make you smile with the sites great jokes, quotes, wallpapers and galleries. Leave a nice review and any suggestions and I will do my best to add the feature or site!!! Now on twitter too. follow for updates and links to the latest galleries. Galaxy S4 keeps shutting off and I doubt it's the battery.